1. I take issue with two recent Greater Greater Washington posts. First, I’m not actually sure I agree with either the framing or substance of this post about BRT. Maybe it helps for planners or self-defined urbanists to think of BRT as a collection of features, rather than a package, but I think that’s just confusing for the public at large, and it makes it way easier for cities to “cheapen the brand,” as it were, by calling something “BRT” that’s really just signal prioritization or some such tinkering. If I were the head of a transit authority, or a think tank, or writing an influential blog, I think I would try to promote the idea that BRT is, in fact, a package of features that together deliver about as good a transportation service as you can get without actually putting vehicles either underground or on an elevated structure, way cheaper than any train technology. The CTA has stumbled around on this, but eventually found its way to my position: its Jeffery Jump line, which has half-mile stations but dedicated lanes only in peak direction during rush hour and no pre-paid stations, was initially billed as BRT, but now CTA officials take pains to call it “BRT light.” Good on them for that. Even worse is what happens when all the tools in the box are used at the same time—what enthusiasts laud as the “gold standard” that resembles a “subway in the street.” If buses are to carry subway-like passenger volumes, traffic lights and pedestrians can’t get in the way. Gold-standard BRT becomes an interstate-like highway through the city, what urbanists have been fighting since the 1960s. Except that virtually nowhere in the U.S. are any bus lines likely to carry “subway-like passenger volumes.” The demand just isn’t there; even in Chicago, the Ashland BRT is only likely to carry around 45,000 people a day. But, yes, BRT does require relatively wide avenues with relatively fast-moving traffic. That’s a feature, not a bug. If we choke crosstown surface transportation, we’re reducing people’s access to the amenities, jobs, and other people that are the very raison d’etre of big cities. Not every street in a major city can be optimized for pedestrians with narrow, traffic-calming dimensions. The other GGW post that made me go “huh?” is this one, claiming that what the DC Metro really needs is to visually differentiate its stations by taking a cue from LA, which does things like put fake palm trees and film reels at its Hollywood station. Supposedly this is because a) people can’t tell one station from the other, which is making them confused, and b) subway stations should be bright and colorful to reflect the joy that is life. 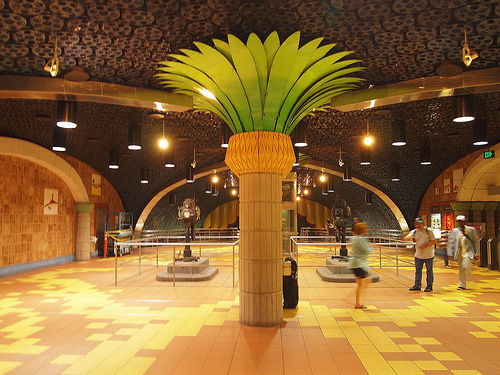 But look: visual cues like palm trees will only register with people who know to associate that with a given station, and those people will already know how to get around. Everyone else is going to take way longer to go through the thought process Giant Fake Film Reel –> We Must Be At Hollywood than they would to just read a sign that said, “Hollywood,” or listen to the driver say, “This is Hollywood.” And as for aesthetics – well, yes, the Moscow subway is truly a subterranean palace, and although I’ve never been there, it looks like LA is doing a good job making their stations inviting, too, in a very different way. But ideas like painting Harry Weese’s honeycombed ceilings blue or orange according to the line that runs there just make me want to gag. 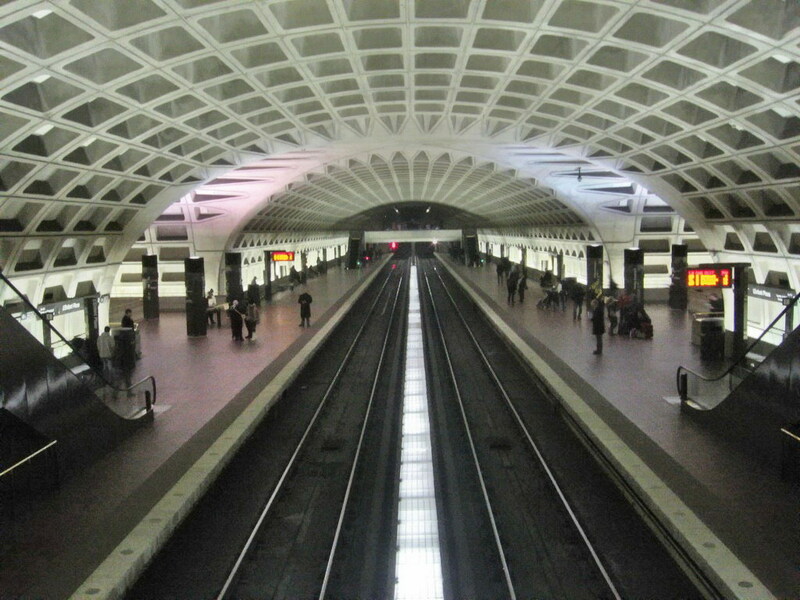 It’s a matter of taste, of course, but DC has what is recognized by a good number of people to be one of the most architecturally significant subways in the world. The people who think its aesthetics are grim are unlikely to be swayed by a coat of paint, and they would be right. Make the lights brighter and add signage, if necessary. Don’t try to make it something it can’t be. 2. At its worst, urbanism as a subculture seems to combine the humorless self-righteousness of activist politics, the impersonal spreadsheet thinking of dataheads, and the bloodless management-speak of business schools. At its best, of course, and at all sorts of points in the middle, it is much more attractive. But even so, I appreciate the attempt by the Wannabe Urbanist to inject a bit of the humanities, or its sensibility, into the conversation. [F]or regular people, urban living in modernity is about absorbing and adapting to changes often out of our control, and negotiating the practical and emotional consequences…. It is easy to get caught up and distracted by the spectacle of urbanism, the glittering megastructures and brand-name architectural projects; it is just as easy to be seduced by the tactical urbanists and neo-Jacobsians into thinking that if we (and be we, I of course mean the urbanists who clearly know what is best for our cities) all just got together with shovels, we could build the bike lanes and curbside seating areas that would solve all these problems. The point I am trying to articulate is that the experience of modern urban living is not a set of images; it is the difficult project of being ourselves in cities whose form and function are controlled by forces of capital, whose interests rarely align with those of any other party. I think that last part actually does the rest a disservice, by limiting the point to the influences of capital. The larger theme is a very powerful one that’s very underdiscussed: the experience of living in a city is terribly humbling for anybody who is remotely honest with themselves. The forces beyond one’s control, whether that’s some other person or collection of persons, or some systemic force that’s not really under anyone’s control, are overpowering. It is challenging both on the level of daily subsistence, and on an emotional, even existential level. Who do you belong to? What do you belong to? The overlapping circles of in-groups and out-groups and territories and allegiances and relationships are almost literally never-ending. Suppressing all those tensions from the conscious mind is possible, I suppose, but they’re always there, and they certainly inform how we feel about the way a city ought to work, and what it ought to look like. It would be nice if the urbanist conversation brought that to the surface every now and again. Also, points for bringing up the sensual experience of cities, which is especially on my mind right now as I’m reading James Baldwin’s Another Country, a book that makes love to Manhattan on every second page, and claws at its eyes on every fourth.